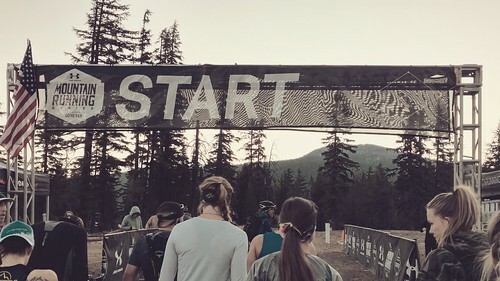 Last year, I did the Under Armour Mountain Series Marathon Relay at Mt Bachelor with some friends, and I got the coolest experience ever getting shuttled up the mountain to the first aid station via ATV (since the territory really didn’t allow for any other method) to wait for my exchange. I got to see all the 50k and marathon runners as they reached the aid station, and quite a few of them had fallen and were bloody and tired from the unforgiving terrain. I remember I had so much admiration for all of them and at the same time, I couldn’t imagine ever doing what they were. Fast forward to the 2018 Under Armour Mountain Series Mt. Bachelor 50k, and I found myself lining up to do just that. 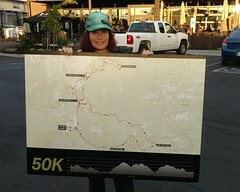 This was only my second 50k, the first being only a couple of months ago, and I felt woefully unprepared. Any runner with kids and a real life knows how challenging it can be to train for a race, and a 50k is not a short distance to contend with. 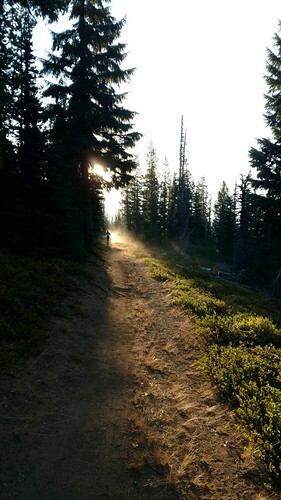 I hadn’t had enough trail training, nor enough back to back long runs, and my nutrition and hydration had been suffering as well. I knew I could make it happen, but I had no idea what sort of shape I’d end up in when all was said and done. The Mountain Series has three races in all: One in Killington, VT, one in Copper Mountain, CO, and one at Mt. Bachelor. They have switched up the order as well as the distances this year, and the Mt. Bachelor event was the inaugural race of the series last summer. I had the privilege of getting to run both the marathon relay (not an option this year, which was not all that surprising considering how tricky it was to get people to the exchanges) and also the Copper Mountain Half Marathon. They were two of my favorite races last year and I was really looking forward to attempting the 50k on the mountain this year. The weather was understandably chillier this year, (the relay was in July the year before,) but it was gorgeous up at the lodge. As the sun began to make it’s appearance, I could tell we’d have great weather for the event, if not a bit cold with the wind. I’d picked up my bib the evening before and was greeted by some of the same wonderful staff that I’d remembered to be so helpful last year, so I was pretty much ready to go when I arrived at Bachelor, other than my belly full of butterflies. There were Under Armour reps there with all sorts of magical automated foam rollers and massage tools to loosen up our muscles before the run, so I checked those out before heading down to the starting line. After a quick rundown regarding the course markings (look for signs, not tape, stay on the trail when there are no markings,) and we were off. I immediately felt like I had lead in my legs and I still felt sick from the breakfast I’d eaten an hour and half ago. Much of it was nerves, and some of it was also that I was so cold that my extremities were feeling the biting wind. But I knew that I had a long journey ahead, so I wasn’t trying to beat anyone and was grateful that the course was relatively flat and easy for the first part of the race. However, it didn’t take long to experience some of the rocky lava rock, and I had forgotten how hard it was to run on from the year before. If you are used to running on gravel, it’s not the same. It’s brittle and sharp and the porous nature of it is just much more difficult under your feet that typical gravel. There is also a lot of sandy dirt at Bachelor, and much of it feels like running on the beach in the really soft stuff that gives your legs an uneven workout. And there are hills. Let’s face it, Mt. Bachelor is a place where people go to ski, so it’s not going to be flat anywhere. There was a lot of climbing, both up and down. There are a ton of places where there are rooty tree limbs and rocks jutting out from the ground and so many trip hazards that you are bound to stumble a few times. I heard the sickening sound of one girl fall right behind me right before the first aid station at mile 7 and she didn’t get right back up. I stopped and asked if I could help, but fortunately, her companion did also so I kept going and saw her again at the end of the race finishing strong. The elevation, if you aren’t used to it there, is challenging. There were several times that I felt short of breath and I never really stopped feeling sick. That could have been my lack of the right nutrition in the months leading up to the race or the food I consumed that day while I was out there, but it could have been any number of other factors as well. The people at the aid stations were fabulous. They treated every runner who stopped like a rock star, eager to refill bottles or to give us any food item at their disposal. I was honestly not blown away by the assortment of options, as it was mostly electrolyte aids and candy, and I would have loved seeing other options like fresh fruit, maybe some potatoes, or peanut butter and jelly sandwiches. These seem to be staples at a lot of other ultra races, but I realize that this event also caters to the 18k, the 10k, and the 5k who maybe don’t need quite the same options as the 50k runners. They did have potato chips, and one aid station had some pretzel chips. My body wanted salt since all the sugary options tend to make me want to hurl. Around mile 20, a volunteer came through in his truck and told me there was fresh fruit available ahead, but by the time I got there, there was only a few small pieces left. The course was very well marked, which put my mind at ease, as I get easily lost on trails. When you are out at an ultra race, you don’t want to have to think too hard, as you aren’t totally yourself after awhile. There were long stretches of time where I saw no signage at all, but there were never any places where I felt it wasn’t terribly obvious where I needed to go. I spent very long stretches of time seeing no other runners out there, and it did tend to play with my mind at times. Sometimes, runners seemed to suddenly appear ahead or behind me and it was like they’d just dropped out of the sky, and then they’d be gone again. There were many times that mountain bikers would come thru and I found myself getting irritable because I was always trying to get out of their way on the single track trails. At first I was friendly, but once my milage began climbing into the 20’s and I was feeling less agile, I was getting cranky about the energy I had to expend to climb up the edge of the path for them to pass. There were also several areas where I was on dusty roads and the wind or large trucks would pass and rustle the dust up into my face and eyes. When I reached the last aid station, I had 5k to go and there was only one climb to get through before it flattened out and I was just trying to run the last 2 miles without walking. Once I was close to the finish, I had more soft sand to navigate before the road got rocky again. There was a small incline, and once I got the top of that, I turned a corner at mile 32 and saw another hill. Many explicatives came out of my mouth. When I finally reached the top, there were photographers waiting there. I joked with them about putting that hill there and they laughed and told me it was all downhill to the finish. So I ran with everything I had left in me, and my watch told me I’d gone 32.36 miles before they put that medal around my neck. They had a few “real” food options at the finish line.. some bagels, peanut butter, and fresh fruit. The oranges were what my body wanted. There was food for sale at the lodge, but they were out of the portabella burgers I wanted, which was the only vegetarian option. I headed for the recovery tent, where all the fancy Under Armour tools were again. This time, after foam rolling my glutes, hips and legs, they zipped me into some compression boots that were the best and most painful thing at the same time. It really helped flush out my legs, especially since I had to climb up the lodge stairs after that. Overall, I would say this was probably one of the most difficult races I’ve ever done. The ultra athletes I saw there, mostly the ones I remembered meeting the year before, were awe inspiring and breezed through it like it was nothing. But I found it to be very tough terrain and elevation, and I would tell anyone not used to the climate to take it seriously. It was also a fabulous race that I’d recommend to anyone considering it.